Fashion Earrings. Type: Earrings. We will try best to solve any problem. Elegant Silver Blue Feather Moonstone Sapphire Wedding Hoop Stud Earrings. Chic 925 Silver Morganite Gem Earring Wedding Party Ear Stud Earrings Jewelry. Gold Lucky Elephant Wedding Ring 10KT White Gold Filled Wide Band Jewelry #5-12. Material : 14K Gold Filled. Fashion 14K Yellow Gold Plated 3-Coin Round long Clip On drop Dangle Earrings. 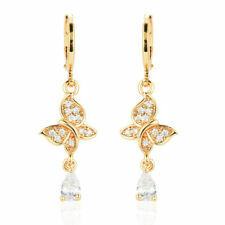 Fashion Silver 9K Gold Filled Cubic Zirconia Teardrop Long Dangle Drop Earrings. Size: about 15 4mm. Main Stone & Size Crystal 2mm. Material Yellow Gold Plated. Accessory Stone & Size None. Earrings Length 45mm. Earrings Width 8mm. Quantity 1 Pair Earrings. Incredible low prices as we have factory to produce our own jewelry. Accessory Stone & Size None. Earrings Length 42mm. Earrings Width 21mm. Quantity 1 Pair Earrings. Main Stone & Size Zircon 1mm. Incredible low prices as we have factory to produce our own jewelry. Here we consistently provide high quality jewelry yet with fair prices. Stone:AAA Cubic Zirconia. Plating:Gold Plated. Material: Brass.